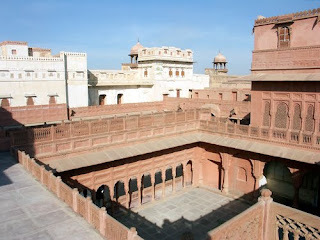 Like Jaisalmer, Bikaner is situated in the midst of the desert of northwestern Rajasthan. Built in 1488 by Rao Bika after whom it is called Bikaner. As in Jaisalmer, where yellow sandstone is used in construction, in Bikaner the local red sandstone forms the main building material. 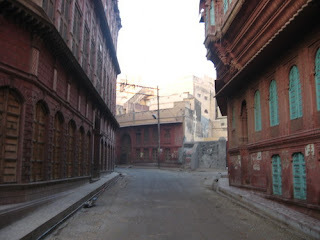 Bikaner city is protected by a 7 km wall outside, and by the Junagadh Fort inside. The architecture of the fort, and the many palaces it copntains, are the epitome of traditional Indian design and decor. For example the jharokas in places are decorated in red sandstone, interspersed with white and blue Dutch ceramic tiles. Some of the palaces have ornate mirror work, paintings, and carvings. The more modern palace of Lallgarh, which is also a luxury hotel, was designed by S.S.Jacob for Maharaja Ganga Singh. Lalgarh also uses red sandstone and local artisans for the exquisite carvings, but is designed in the mixed Rajput-British style. The business communities like the Agarwals, Rampurias, and Kotharis, own palatial mansions called havelis, hidden away inside the old city (second picture). These and the homes of the common people are built to keep the denizens cool, with their extended balconies and latticed windows, beautifully carved and decorated with lovely floral designs. The traditional artisans and stone-cutters of Bikaner are called Salavats and Ustas. 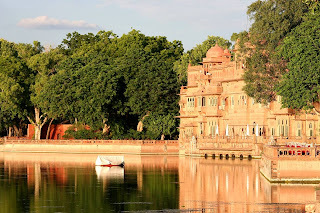 ALthough Bikaner is in the desert it is dotted with natural lakes like Kodamdesar and Gajner, which were expanded and maintained by the Rajput rulers, and even today attract thousands of waterfowl. The rulers also built kunds, which are underground tanks that harvest rainwater. In the 20th century Maharaja Ganga Singh brought water from the River Sutlej via the Gang Canal (named after him), which transformed many parts of the kingdom into a blooming garden.